In this family, we all love beef jerky. Given that love for jerky, when asked if I wanted to pair some House of Jerky products with wine, I figured it would be a blast. I was sent a number of samples, 13 in total, of House of Jerky’s line of products. There is a variety of meats- boar, buffalo, venison, turkey, beef, as well as seasonings including black pepper, sweet & spicy and HOT. I’ve already reviewed the seven wines to pair with jerky or smoked meats. So, lets get to the jerky and wine pairings. WHO IS HOUSE OF JERKY? Ron and Janie opened their first jerky store in 1996. They had been making jerky for years, and basically selling it on the road side. They believed in their product, and had a vision to deliver the best jerky in the house to your house. Starting with one 100 square foot store, they expanded to an 800 square foot store within a year. House of Jerky now has over 20 retail locations across the US. I really like the quality of the products overall. I was a tad concerned about the price, as it’s higher than the mass produced “Jerky” you get at Walmart. 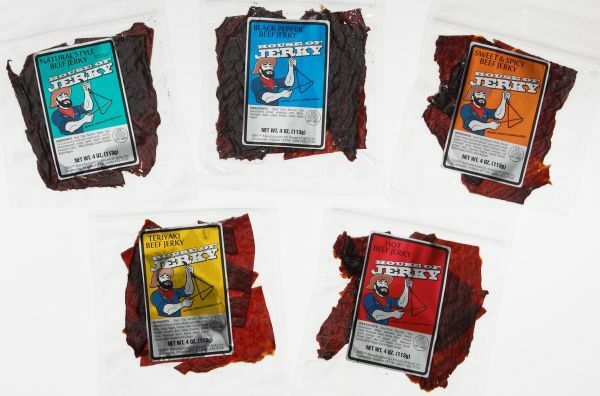 However, some comparison shopping between premium jerky brands show they are competitive with other jerky makers. There is even a fairly popular grocery store brand that ounce for ounce is the same price. WHAT JERKY DID WE TRY? Black Pepper Beef, Buffalo, and Wild Boar Jerky – All three meats have a big soy flavor, a little salt, and not a big pepper punch. I found the buffalo nicer than the beef for my tastes, with the wild boar right behind it. It has good chew, medium pull , and great flavor.The Black Pepper options sing with the Eberle Syrah 2011, as the salt and soy bring the fruit of the wine out very nicely. The Domaine Mas Du Bouquet is ok with the black pepper jerky, though it’s a bit too soft and feminine to stand up to the salty soy flavors. The Leitz Spatlese Riesling seems fresher and fruiter paired with this option, while the Bitmore Riesling takes on a interesting smokey flavor. The Ca’Bianca Moscato also works really nicely, perhaps best with the black peppery buffalo jerky. Teriyaki Beef Jerky – The texture was a bit less dry than the Black Pepper options, which I liked. The palate has a sweetness, which was ok with the Jip Jip Rocks Shiraz. Paired with the Seghesio Zinfandel’s berries and spice flavors, this jerky seemed a nice pairing. However, it was the Eberle Syrah that took on 100% different characteristics. After a bite of the jerky, the wine shows amazing coffee flavors, with tobacco and dark cherry, but no spice. Teriyaki Turkey Jerky – Similar to the beef in flavor, with a little more pull/chew, this was a favorite of mine. The Jip Jip Rocks Shiraz worked best with this jerky. The approach was lackluster, but the spice on the finish really packs a whallop, and that black pepper balances the sweet marinade. The Eberle Syrah works ok, though the fruit is gone, perhaps some tart black cherry, and an earthy leathery tobacco. Teriyaki Buffalo Jerky – This jerky had much less pull, and was a little less dry than the beef. The flavor was similar to the previous two, though not as sweet. The Eberle was really the only wine that paired with this option. The fruit is dry and dusty, and the spice is nice and warm on the palate. Sweet and Spicy Beef (and Turkey) Jerky – These options were similar, just with different chew to them. The Jip Jip Rocks Shiraz can’t tame the spice, it’s a blow your head back kind of power. The Seghesio Zinfandel was really nice, but not for the weak tongued. The spice and pepper is ripping when pairing the two. Eberle Syrah seems to like these jerky options, the fruit is present, it keeps the spice under control but doesn’t kill it. The Domaine Mas du Bouquet is dusty and dry, showing violets and almost no fruit, but it does integrate with the spices. HOT Beef (and Buffalo) Jerky – great pull and great chew, not super dry, and the heat is big – boom! The best pairing was the Ca’Bianca Moscato, as the white flowers and honeysuckle just pair perfectly with the heat of this House of Jerky option. Even a few minutes after the sip, the heat from the jerky shows, but the wine is still in harmony with it. 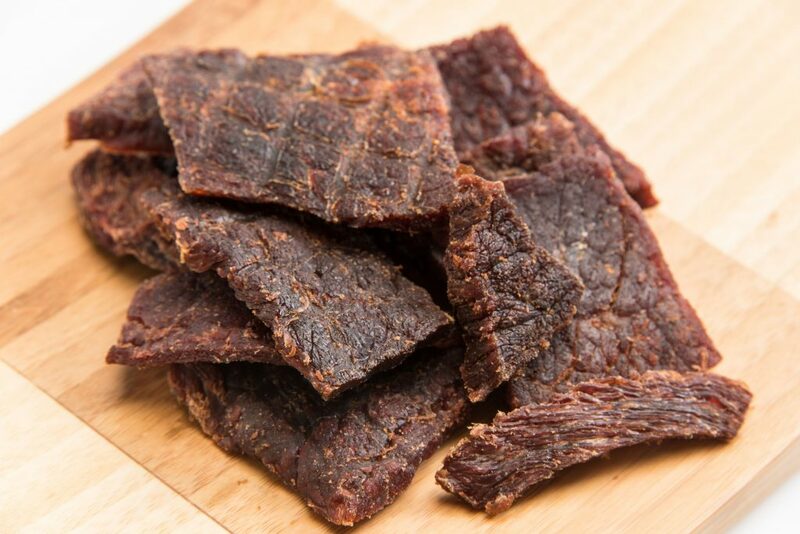 Natural Style Beef Jerky – This sample was a little more dry than all the others. The flavor that came through most was soy (sauce). I’ll say this – the HOT jerky, it’s hot. You need to be a fan of hot foods! Of the Black Pepper Jerky options, the buffalo and wild boar were better than the beef in my opinion. They had a nicer black pepper flavor, where as the beef had a big smoke/soy flavor that took center stage. I really liked the pull and chew of the wild boar best of the three. And, I can say I was eating wild boar! WIN! As for my favorite House of Jerky products, I really liked the Teriyaki Turkey and Buffalo jerkys. They weren’t salty or very soy based, and had a touch of sweetness. My next favorite was the Sweet and Spicy options, because the balance between the two flavors was fun. How about you? Are you a jerky or smoked meat fan? Let me know what wine you prefer with your smoked meats by leaving a comment below!